DON'T use the driver for this printer packaged with FC6. It won't work. I tried it but I think you must try it too to prove me wrong. Of course YMMV. The driver is here. Before that, you have to read what the author's have to say on the website. It's important!. 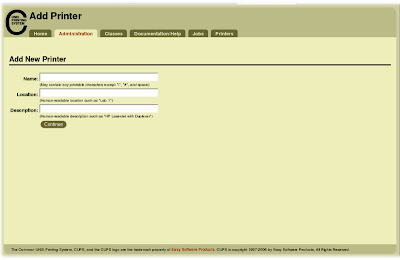 Follow the instructions on how to compile and install the ICM and the firmware files. Included in the tarball is the PPD file for working with the printer. Once all the above completed, add the printer to cups so that she knows where to send files for printing. Put the name, location and description for the printer. At this stage, it won't set the 'real' things yet. Select the device for the printer. It obviously "Windows Printer via SAMBA". At this stage, click Browse button and find the PPD file in the folder where you extract the tarball. 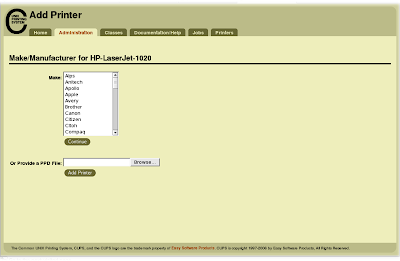 Find the folder named PPD in there and click on the file named HP LaserJet 1020.ppd or a file named after your printer model and then click Add Printer. Now you are done setting up the printer in CUPS system. 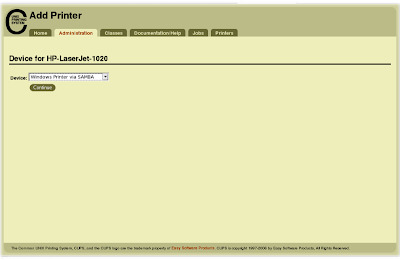 To see whether the printer has been added to the system, click Printers tab. 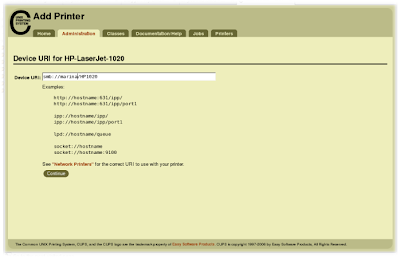 If it is listed, then you are now good to test the printer by clicking on Test Printer button. For now, the driver supports printing in Black and White only. Works are in progress though to support color printing.